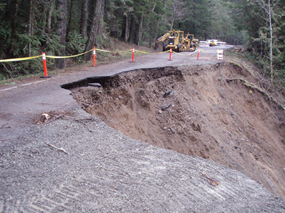 Slide on Hurricane Ridge Road, January 2010, Photo from NPS website. This page provides a map and list of the major access roads into the trailheads of the Olympics. The Olympic National Park website posts the current road conditions here: http://www.nps.gov/olym/planyourvisit/current-closures.htm. NPS Map modified by Steph Abegg. Much of this information is from the NPS.gov website referenced above. Weather permitting, road scheduled to be open Fri, Sat, Sun & holiday Mon (1/18, 2/15). Road open daily Dec 18-Jan 3 EXCEPT for 12/25. Road closes all other days. ALL vehicles must carry tire chains Nov 20-March 28. Obstruction Point (Hurricane Ridge area)	 July 2-Oct 3: Weather permitting. May close at any time due to snow. Oct 3-18: Road may close to overnight parking at any time, or may close for the season at any time.